If you haven’t taken a drive through the Beaver Valley during the height of the autumn, you’ve been missing out on one of Grey County’s most beautiful scenery. No worries, follow this route and you’ll experience the best of the area’s natural beauty as well as the warm hospitality that our region is famous for! 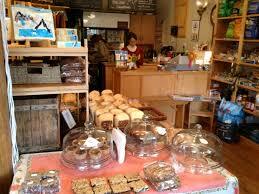 Begin your day in the charming town of Meaford, located on the southern shores of Georgian Bay. 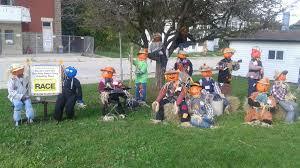 Fall is the perfect time to visit Meaford as the annual Apple Fest and Scarecrow Invasion ensure that the downtown core is decorated in its seasonal finest. Grab a cup of coffee to go at McGuinty’s Cafe or sit down to a hearty breakfast at Eggcitement Bistro , then take a stroll through the picturesque town and along the harbour for some great views of Georgian Bay. Don’t forget to make the obligatory tourist stop at Fred Raper Park to take a photo on one of the “Big Red Chairs”! No trip to the Meaford area is complete without a stop at Grandma Lambe’s “flagship location” where you’ll find fruit fresh from the orchards, giftware and the best pies around! Do not miss the chance to take one home with you! The drive along Grey Road 13 is a lovely one, no matter the time of year. There are plenty of opportunities to stop and snap a photo of the truly breathtaking vistas as you enter the Beaver Valley. When you’re ready for a break, drop in at the Beaver Valley Orchard and Cidery where everything is made from locally grown Georgian Bay apples. Situated on the Niagara Escarpment in the heart of the Valley on one of the most scenic routes, it’s an ideal stop on your route. Visit the Tasting Room in a renovated heritage barn to sample and purchase the ciders produced on site. Again, you’re best not to miss out on the chance to take some home to enjoy later! Facility tours run every Sunday at noon sharp. 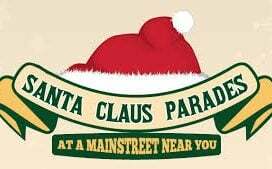 Groups of 6 or more are advised to make reservations . Just 5 kms further down Grey Road 13, you’ll enter the quaint village of Kimberley. Do yourself a favour and visit Old Baldy, a lookout point on the Bruce Trail that offers an amazing view of the village and valley. You won’t be disappointed, especially when the leaves are full of colour. Those looking for a moderate walk can drive up the hill to a parking lot and follow the marked trail to the famous lookout point. If you’re up for a bit of a challenge, and that’s not much of an exaggeration, you can park further to the west along Grey Road 13 and find the blue gate that marks the back entrance to the trail (ask a local to point it out). 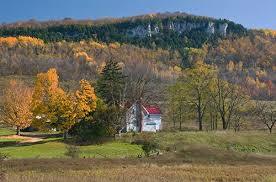 This leg will take you up the steepest part of the escarpment on foot, so be prepared to get sweaty! The panoramic view of the Beaver Valley that you’ll get once you make it to the top is well worth the effort. Once you’ve completed your hike, a pit stop will be in order to allow yourself some much deserved refreshment! Popular with drivers, cyclists and hikers alike, the Kimberley General Store is sure to offer something to get you refueled. 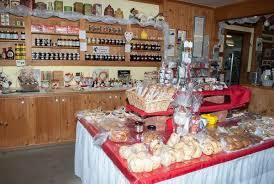 The store is also considered a hub for those looking to source local products and organic goods. One of the stops on the Grey County Waterfall Tour, Eugenia Falls Conservation Area includes a year-round trail that takes you through the woods and along the top of the “Cuckoo Valley”, offering great views of the 30 meter high waterfall. Another lovely sight to see during any season, the falls are particularly lovely during the autumn months and the hike is an easy one…which you’ll appreciate if you took the difficult route up Old Baldy! 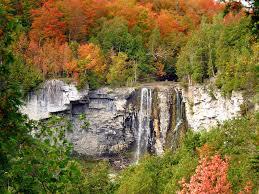 Download your copy of the Grey County Waterfall Tour here. 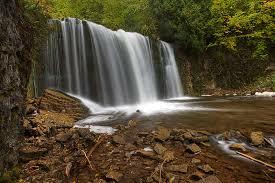 Often called “grey County’s Best Kept Secret”, Hogg’s Falls is both very pretty and easy to access. The trail is clearly marked and terrain is easy to navigate so young kids and the elderly will enjoy it too. If you’re still feeling energetic, leave your car in Eugenia as you can actually hike from Eugenia Falls to Hogg’s Falls (roughly 12 kms).